The Three Wheel Motorcycle that women love to ride! Women enjoy riding a three wheel motorcycle! Whether it be a trike or the Can Am Spyder, pictured above, we have seen a few articles come our way from women who prefer the three option for riding. We have been asking women riders to share their bikes with us since 2007 and we've collected a small, but growing, collection of articles about three wheel motorcycles. One article is from Sam in Canada who loves to ride and wanted to keep riding after losing both legs in a motorcycle accident. We've also started to hear more and more about the Can Am Spyder such as the one that Rosemary is riding in the picture. We enjoy hearing about trikes, three wheel motorcycles and the Can Am Spyder. We don't know that much about them, especially the Can Am Spyder, and would love to hear about your experiances and why you love to ride three wheel motorcycles. Please share with us as we would love to have your stories and opinions on our site and I hope you enjoy the articles our visitors have sent in to us. 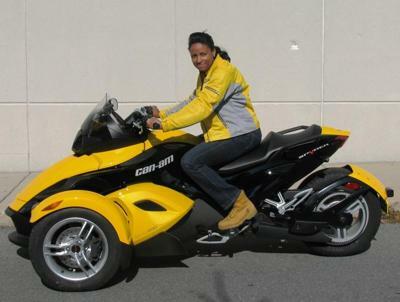 lADIES DO ANY OF YOU RIDE A CAN-AM SPIDER? ANY PROS OR CONS YOU CAN TELL ME ABOUT. LOOKING TO GET ONE AS MY FIRST BIKE. ANY SUGGESTIONS WELCOMED?